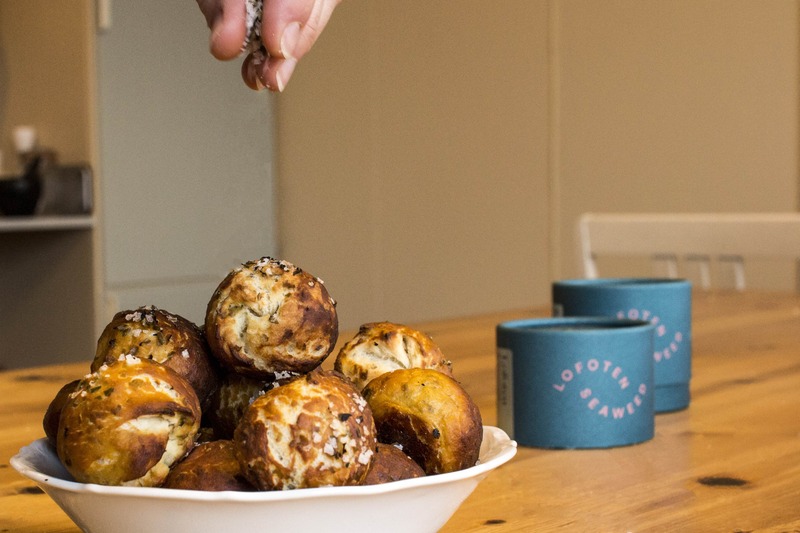 Seaweed Salt Pretzel Bites - Lofoten Seaweed | From Lofoten, Weed Love. 1. Whisk the yeast into the warm water. Allow to sit for a couple of minutes. 2. Meanwhile, in another bowl, stir together the rest of the dough ingredients. 3. Add the yeast mixture to the bowl, and mix until it forms a dough. On a lightly floured surface, knead dough until it is smooth and elastic, 8 to 10 minutes. 4. Transfer dough to a lightly oiled large bowl and turn over to coat with oil. Cover with a kitchen towel and let rise in a draft-free place at room temperature until doubled (2 to 3 hours). 5. Punch down dough and divide into quarters. Roll each quarter into a long snake. Cut each snake into 12-14 pieces, roll each piece into balls. 6. Heat oven to 230°C. Oil 2 large baking sheets. 7. In a saucepan, bring water and baking soda to a boil (mixture will be foamy at first, but foam will dissipate). In batches add pretzel bites and cook 30 seconds, then transfer with a slotted spoon to baking sheets. Quickly sprinkle with seaweed salt before they dry. 8. Bake in oven, 8 to 10 minutes (watch closely toward end of baking; bites brown quickly in last few minutes).